I cannot believe it is already September and this week is the week of New York Fashion Week. I am living vividly through all of the Insta stories of all the bloggers I love and follow. Watching a sneak peak of the Tadashi Shoji show from yesterday and OMG so many gorgeous and feminine gowns. Hopefully I can join you all next Spring or Fall for New York Fashion Week. So yeah, Happy September and let the leaves' season begin! Here is what I am up to and linking with ANNE for her currently linkups each month, as per usual. 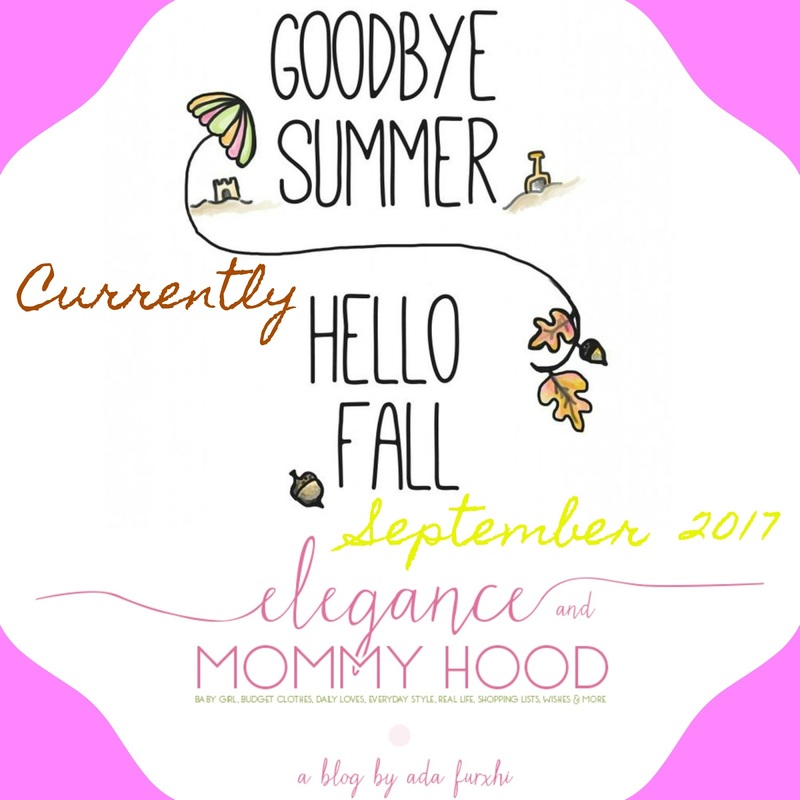 celebrating: the start of Fall - though I am really not ready for it, but let's face it, it has been feeling like Fall here all September and actually since August. It is 54 degrees out as I am typing this, that is cold considering is still early September. I will be celebrating the Fall in many great ways Fashion-wise. In September I have not one but two big collaborations with many bloggers for "The September Issue", one will be blogged on Tuesday next week and it is all about styling a white dress for Fall and you have to stay tuned for the second one on September 26th where we all show you how to style/wear a dress for a Fall wedding. And in October, myself and 6 other bloggers are doing another series. We will be choosing 5 pieces to wear and remix each day of the month (for 31 days); the idea is to style at least one of the 5 pieces each day. I am looking forward to that and I will be sharing those pieces on my blog, this coming Monday (next week). watching: currently I am watching "The Young and the Restless" (on the background, as I type this). Does anyone else watch soap operas?! I can't help it, the glamour and fashions on them is top notch. However in general, I am watching a few favorites such as the new season of "Project Runway" a show which I love - even more so this year where they chose models from all sizes; and "Big Brother" which ends in less than two weeks and I cannot wait to see it all till the very last episode. Love that show so much. Lastly, I am very behind but catching up with both "America's Got Talent" and "World of Dance". So much great talent on both of these shows. welcoming: Fall season in general especially when it comes to apple-picking - we already went once this Tuesday, this week - and the gorgeous nature associated with Fall in Michigan. I am also welcoming and anticipating Fall fashions and with the exception of a few fall basics and some new boots, I will be mostly shopping my closet this year. preparing: for Vivian's start of school. She starts school for the first time ever this year and a little later than most - her school starts on September 18th - but that's OK. I already purchased her back-pack last night and shared a small video of it, when I surprised her with it last night so check out my stories. She loved it and she was so happy to finally have her back-pack. She is over the moon about starting school, she cannot wait. I think pre-school will be a great experience for her, especially since she loves kids, making friends and she loves learning in general. She is a very intuitive little girl. photographing: some Fall outfits for sure, it is about time I share some Fall outfits on the blog and there will be at least 2 next week, though I have a ton of Summer outfits that were never blogged. Why aren't there 8 days in a week?! I am also photographing today my Little White Dress for Fall (to be blogged on Tuesday Sept 12th) and the 5 items I am choosing to remix for my October Style Challenge and details about that challenge more on Monday's post (Sept 11th). Last, I am also photographing some items I am listing to sell on Poshmark, almost none of them worn or only worn once or twice. Once I do that, I will share my Poshmark account with you. Here is a walk down memory lane with outfits I have shared on the blog, during this time of the year, on previous years. Enjoy and tell me your favorites! When I was pregnant with Vivian, it was during most of Spring, all Summer, all Fall and part of the Winter (since she was born in January). 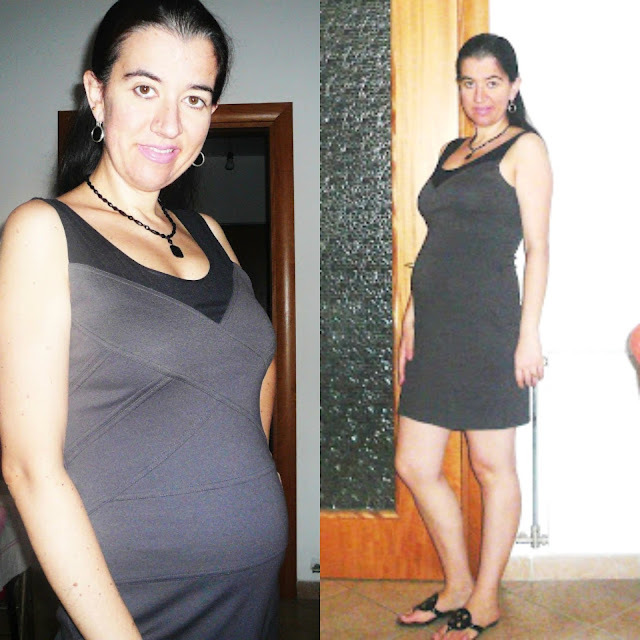 I wore a lot of dresses - none were maternity - while pregnant since it was mostly hot and Septembers in general are very warm in Tirana, Albania where I was living at the time. So, these two Dress Outfits are from September. Actually Summer 2012 was a very hot one and we had sort of an Indian Summer, late through October. 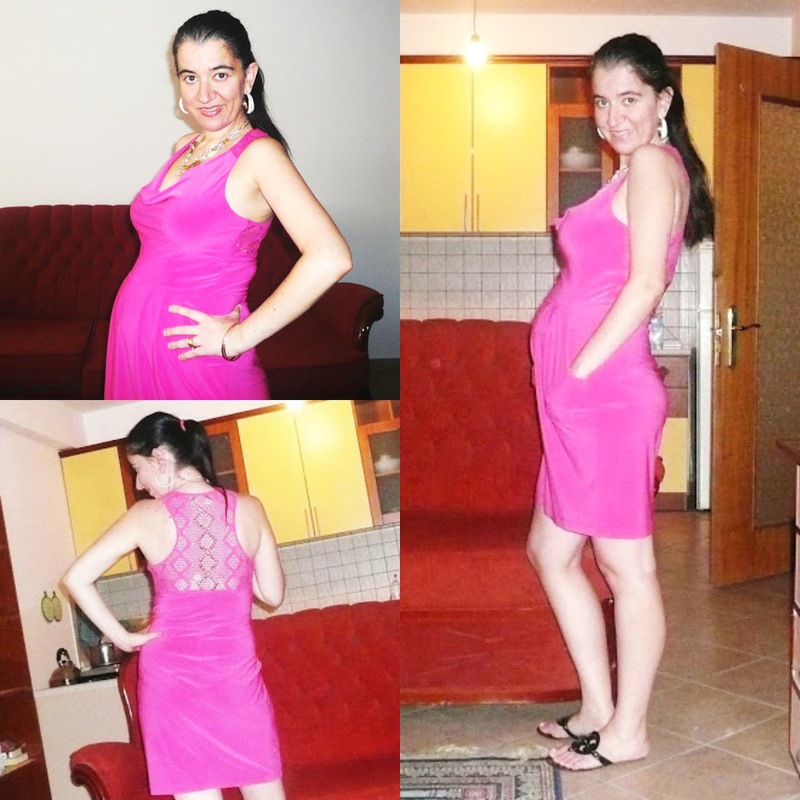 This Hot Pink Draped Jersey number worked for my pregnant belly all the way through 7 months. I wore it a few times at work too with either a cardigan or blazer on top. I just love the length, gorgeous pink shade, the fact that it has pockets and especially that beautiful crochet cross-back detail which has some silver studs creating a diamond mosaic, in the middle, too. I accessorized it with Cream+Gold Enamel Hoop Earrings and a Three-Stranded Beaded Necklace with gold, silver and lime green beads. Unlike the hot pink dress this one is a bodycon style and Express comes out with similar dresses like this every year. I called this a fun, happy dress because it is not a boring gray dress. The black neckline is completely mesh, so it went so well with all of my black accessories: my Beaded Crystal Necklace and Black Patent Leather Tory Burch Thong Sandals. Notice that those are the same sandals I wore with the Hot Pink Dress. I wore these cute and comfy sandals a lot that Summer. I had these sandals for 4 years and I wore them a lot and walked wearing them a lot in the city. They were worth their hefty price for sure. I also accessorized with some Icy Pink Lipstick and some Small Silver Hoop Earrings. In the fall of 2014, I did my very first 30 for 30 remix challenge and it was also my most successful one, in my opinion (I totally failed to finish/photograph /document all of my 30x30 challenge outfits from this Summer 2017). One of the items I picked to remix, was this Silky Midi Olive Dress by H+M which I wore it as a skirt here, with my Black/Fuchsia/White Floral Silk Off-Shoulder Blouse (which also has a full slit on each sleeve - talk about all 2017's trends in one pretty blouse). 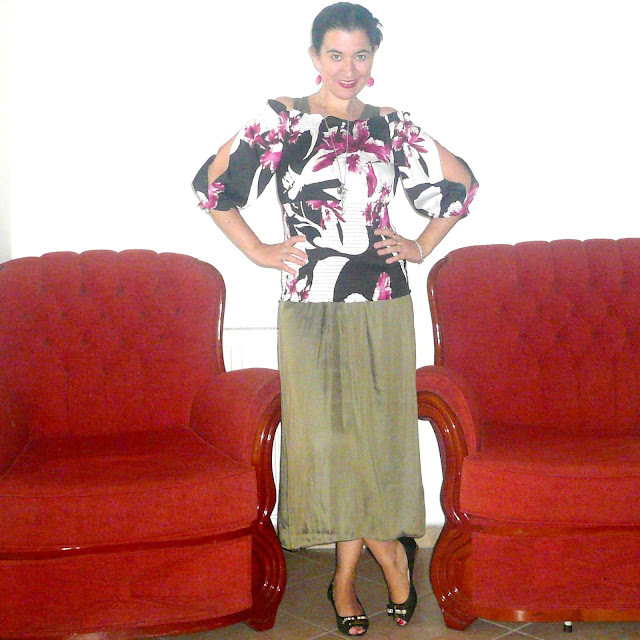 To bring out the colors of the blouse, I paired it with some Low Wedge Perforated Peep-Toe Shoes which have a skinny silver pave bow and some simple Fuchsia Plastic Drop Earrings. 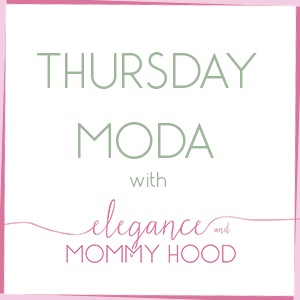 Such a simple but put together mom look for a SAHM (at the time) to a very young toddler. This was the 24th outfit from my remix. This post featured two bright-colored, Summery outfits I wore during my late Summer/early Fall remix in 2014. My favorite of the two was this one here wearing my Gorgeous Yellow Skinny Pants which have white polka dots with this Fitted Soft Cotton Forest Green Tee and a Medium-Wash Denim Vest on top. In my opinion this outfit is a great way to transition into Fall. Vests especially denim or utility vests are great Fall staples. As you can see, I smartly selected a few dark green items for my remix that year because I saw them as great colors for both Summer and Fall. Oh and those Rainbow Espadrille Wedges are so gorgeous. They are probably somewhere in Albania still. They certainly go with everything and they are some of my most favorite wedges I have ever owned. Payless, too. Look at our matchy rosette shoes - perfect for a Summer Wedding, no?! Last year I was invited to a Labor Day weekend Summer Wedding. The wedding venue, atmosphere and event were a little low-key and not too stuffy or fancy. 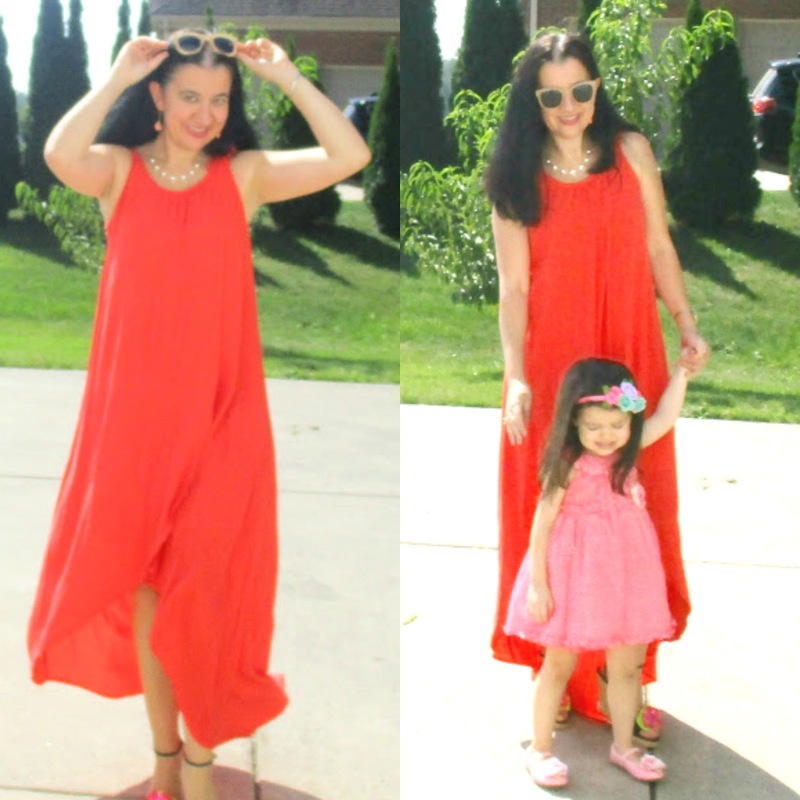 To celebrate both their wedding and the Labor Day I decided to style this Gorgeous Orange-Red Hi-Lo Maxi Dress with a matching little girl in a Beautiful Polka Dot Tulle Frilly Dress. 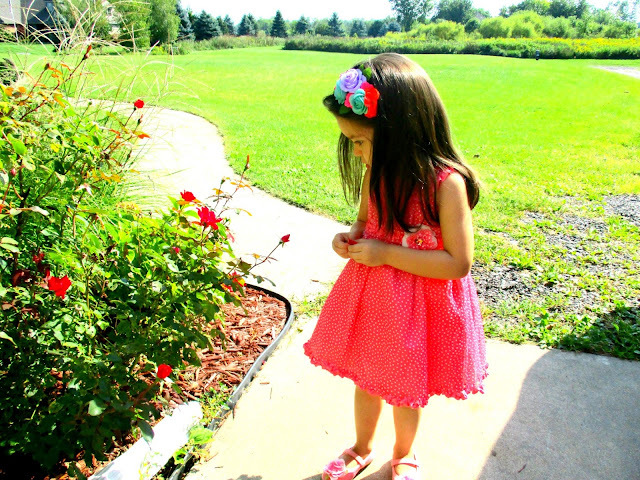 I loved that Vivian's Colorful Rosette Headband matched my Rainbow Ombre Rosette Wedges. Speaking of pretty wedges, this black pair with the bright roses is also a favorite of mine, as are the striped espadrille ones from the previous photo. I chose Simple Coral Teardrop Earrings and a Simple Statement Gold-Tone Spiky Necklace to wear, as well as my Quilted Black Mini Bag. In this blog post my friend Rachel also joined me and she too wore a pretty red dress for a Summer wedding (check out my post linked, for more pics). 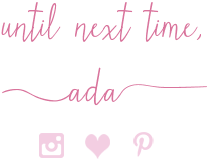 Rachel doesn't blog anymore but she also has two darling little girls and is very active on Instagram so you can follow her there. I always love the looking back at past outfits part of my currently posts and I hope you do as well. I am actually quite happy with all the 5 outfits above especially with both of those bright dresses. Bright colors are my jam! Here is the logo for "The September Issue" one of the exciting things coming to the blog, this month!! Many fun things and lovely Fall outfits coming to the blog in September and October so stay tuned, dear readers. Thank you all for your support and your comments and make sure you follow me.